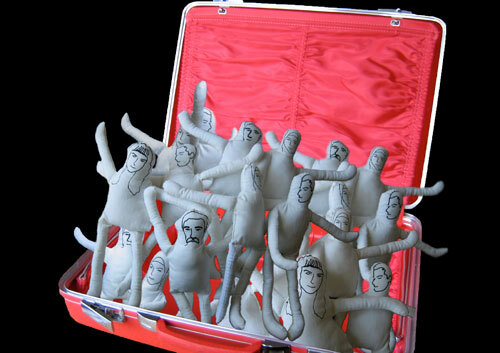 Initially ‘eee-EU-uuu’ consists of 27 puppets (number of EU member states) each with a unique face representing citizens of Turkey, springing out of a red luggage like a Jack-in-the-box. I have chosen individuals who diverge from the commonly accepted norms in terms of their life philosophies, activities and ethnicities. Because of the nature of your Biennial’s restrictions these cotton puppets can easily travel in any size bag tied together with an elastic band, which minimizes their size and volume.